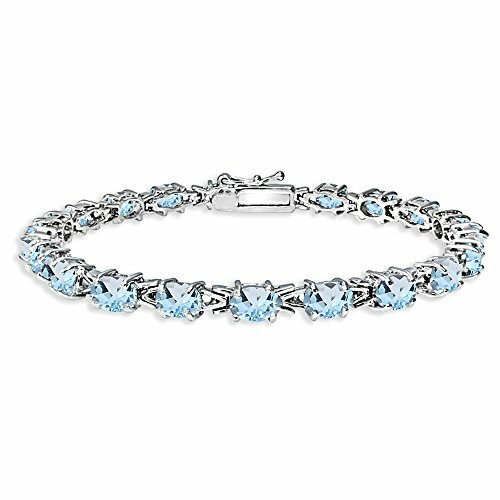 This classy and elegant tennis bracelet features 6x4mm oval-cut blue topaz gemstones. The bracelet measures 7.25 inches and secures with a box tongue and safety latch. FEATURE - This classis tennis bracelet displays 6x4mm oval blue topaz gemstones. This gemstone bracelet in fine jewelry is a great addition to your topaz jewelry and gemstone jewelry collection; it will enhance your daytime and evening attire. It can be purchased as tennis bracelets for women and tennis bracelets for teen girls. CRAFTED - This fashion bracelet is crafted of fine sterling silver, nickel and tarnish free. It measures 7.25 inches and secures by a box tongue with safety latch.